Now 250Mb isn’t a lot of data, but it still represents about a million keys to expire, and it made sense to clean it out given that our normal daily cycle was about 30-50Mb. Once we released a code fix on the 19th, the keyspace stopped growing, but because the keys had no TTL set, we would never get the memory back unless we flushed the entire database, or expired them manually. Obviously, we preferred the latter option. Knowing that you shouldn’t use KEYS (did I mention you shouldn’t use KEYS? ), my first attempt used the SCAN command to obtain a list of keys and iterated over them with the EXPIRE command. I started with a script from this stackoverflow post, and modified it because the output didn’t seem to be what it was expecting. echo "Expire keys from Redis matching a pattern using SCAN & EXPIRE"
echo "Usage: $0 <host> <port> <pattern>"
The SCAN command returns a cursor, followed by a list of keys. Or it might return no keys at all. So the script has to separate the keys and cursor from the output (lines 19-22). For each key, we run an expire command (lines 25-27). After the first set of keys, we return to the start of the loop and call the scan command again, this time using the cursor that was returned last time. 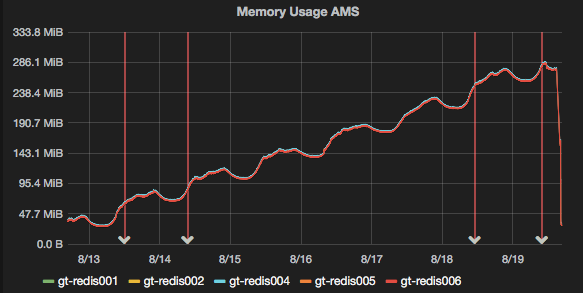 In this way, Redis knows where you were up to and carries on where it left off. Redis returns a cursor of 0 when it has iterated over all keys, so when this happens the while loop ends. While it worked well, it processed at a rate of about 100 keys per second. With a very small database, this might be fine, and left to its own devices, it would have taken just under 3 hours in our case. I figured we could do better. Redis supports server-side scripting in the lua language. Lua is not a language I’ve used much before, but its syntax seems fairly logical. echo "Expire keys from Redis matching a pattern using SCAN & EXPIRE"
It requires some extra logic because we need to know the number of keys we’re operating on, so we can feed that to the EVAL command. And scan doesn’t return a consistent number of keys. Thus I convert keys to an array, and count the number of elements. I also added the COUNT parameter to the SCAN command, to increase the number of keys we operated on at a time. The default of 10 doesn’t matter when you’re calling redis-cli for each key, but when each scan is only one eval, multiplying the count by 10 means doing 1/10th the number of round-trips. The lua script has to iterate over the keys given, check whether the TTL is -1 and if so, run EXPIRE. You could also just run expire anyway if you don’t care about resetting all ttls. Where flashMap_* is the prefix we’re searching on. With this simple lua script, and operating on blocks of keys courtesy of SCAN, we greatly reduced the number of round trips to redis and processed the keyspace much faster than before (about 3500 keys per second in this case). Or in practical terms, what would have taken 3 hours took less than a minute. The first few scans might not return anything close to your hint. With a value of 100 I noticed it took quite a few iterations before it started returning large blocks, but it quickly ramps up. Some refinements could be made here. Firstly we could combine the shell and lua scripts into one file, and also take the block size and TTL to set as parameters. As it is, usage is a little cumbersome. Please feel free to fork and improve, and if you do, post the link in the comments. As a final word, I would suggest not using blocks that are too large. Firstly you might run into the limits of the number of arguments that lua can process, and secondly, lua scripts in redis are atomic operations and *will* block while they run. Thus, you should only run lua scripts that are very fast. In my case, a block size of 100 offered great performance without blocking anything for too long. Thanks for the feedback Itamar, you’re most welcome! The original script is being slow because its not using http://redis.io/topics/pipelining. Pipelining is a perfectly valid solution, depends whether you prefer your logic in lua or bash. I prefer the elegance of the lua solution though. Remembered it again today while reviewing code submitted by our dev team I found usage of keys in a key service that will frequently do that against a redis deployment used by a distributed system with several thousand clients. You’d think the warning on the redis docs would be sufficient deterrent, but apparently it’s not. Fantastic Alex, thanks. Seems you have a bug tho… the for loop on line 25 of your bash script should have a “<=" rather than just a "<", i.e. Thank you Mike, that’s a subtle bug but an important one, I will update the post! Unless I’m mistaken, this approach still incurs the round-trip overhead for the SCAN results. Is there a particular reason you don’t execute the SCAN in Lua as well? Yes, each SCAN is a round trip and incurs some overhead. I didn’t do it in lua for a couple of reasons. Firstly, we need a way to limit the amount of work being done in each round trip to avoid blocking redis. You could reduce the number of trips to one by scanning the entire keyspace in one go, but this solution seeks to avoid doing that. Secondly, the number of round trips for SCAN is very small compared to the EXPIRE commands, because we’re only doing one SCAN per 500 keys (in my example above). So where expiring 500 keys wold previously have required 501 round trips, it now requires 1. Thus, the benefit of doing the scans in lua is 500x less than doing the expires (depending on the scan size). If you want to do less rounds trips, you can increase the size of each scan but this means doing more work in each iteration, and thus blocking redis for longer. I think what you might be getting at though, is whether it’s possible to do the scan in lua, while yielding to other clients on each iteration (to avoid blocking). You could implement the bash logic above in a language with a native redis client (python, ruby, lua), which would enable you to reuse the same connection and thus reduce tcp overhead. The benefit would be relatively small though, and this was done for a one-off batch operation, so that level of optimisation would have been somewhat premature. If you do come up with a pure lua solution or reimplement the bash logic please link to it here, I’d be very interested to see it! You, Sir, I appreciate your work. Thank you very much! Your documentation saved me a lot of time and reduced the impact on our installation to nearly zero. I adapted your script to delete nearly 8M keys from a deprecated hash. Many thanks Tim, I’m sure that will be useful to others!